HOME /Blog /V-Express Steam Train with Tender – experience the power! 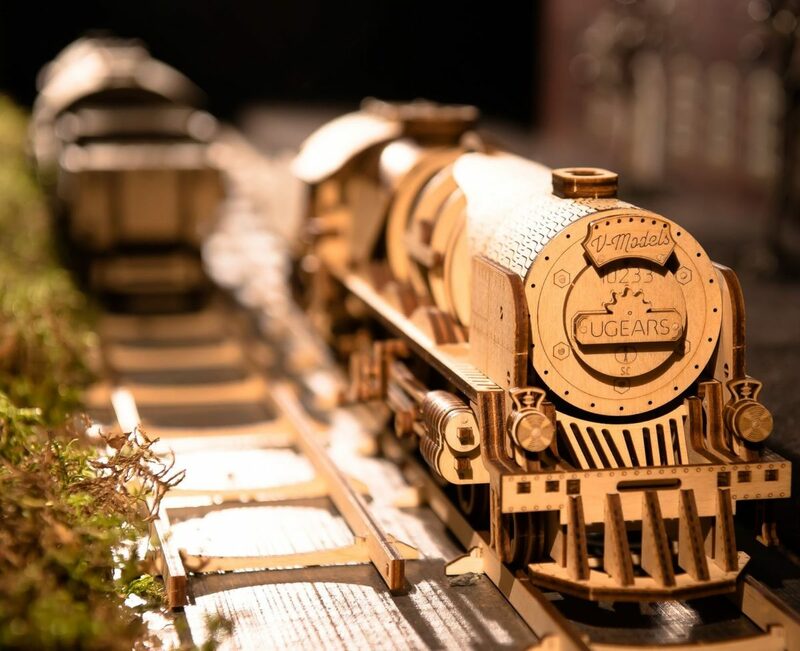 UGears company introduces its new model, the V-Express Steam Train with Tender 3-d puzzle. 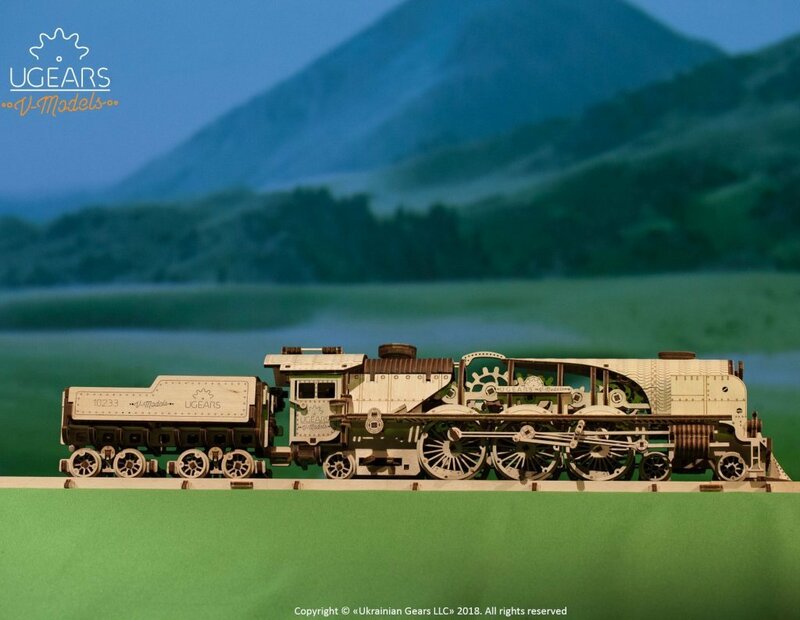 The design of this model is based on the real prototype of the 19th-century express steam locomotive capable to develop an incredible for that time period, speed. The V-Express Train set includes a model of a locomotive and a tender and consists of a total of 538 pieces. It could take up to 16 hours to assemble, however, we guarantee that the result will exceed all of your expectations! What is so unique about UGears V-Express Steam Engine? This model consists of 2 separate modules, a locomotive, and a tender. Each of the modules is a fully functioning unit and can work independently. The front of the Tender is equipped with a coupler that connects the Tender with the Train, and a small door that provides an access to the coal chamber. The special lever opens the side doors of the Tender upward for an easy load and unload of coal supplies. Mounted on 4 axles with spinning wheels, the Tender moves swiftly and effortlessly, pulled by the Train. 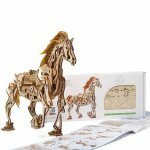 Made with natural wood materials, all the elements of the Tender are easy to assemble without the use of glue. Design of the Train element is even more sophisticated because it was designed as a main moving force of the whole unit. The self-motion is achieved by the work of the rubber-band mechanisms hidden inside the body of the Train. Here are some of the special features of the Train. – The cabin has fully functioning opening doors. Look inside, and you can see the flaws that, when open, reveal the coal-burning furnace of the Train. – Turn the lever located on top of the Train’s roof, a few times to activate the rubber-band mechanism that set the Train in motion. Once the locomotive engine is cranked up, its ready to go. Simply release the trigger and watch your UGears V-Express chugging away on an exciting adventure. – When the Train is on a move, it reveals its most intriguing feature, the complex mechanisms of operational gears hidden inside its body. When cranked up, the mechanism transmits the force that supplies rotation to the train’s wheels, setting it in motion. All these and other sophisticated features make UGears V-Express Steam Train work and look just like a real express train, fun and exciting to play with. You can order your own V-Express Steam Train with Tender 3-d puzzle from our website now. UGears Aviator – make your dreams of flying come true!